“You can?” It was so sweet of her to know how I operate. She was right. Yesterday morning I busily and methodically went through the house, making beds, folding dropped clean clothes and putting them away, hanging up jackets and shirts, sponging the kitchen table, and straightening books and papers on the coffee table. That’s my modus operandi: to deal with percolating fear, I keep busy. By the time Jimmy and I left, yesterday morning, for the hospital at 11am, the house was as neat as if we were expecting company. My hair looked great and perfectly straight, because I had blown it bone dry, which I rarely do in the summer. My finger and toe nails were trim and clean — don’t anesthesiologists examine the nail beds for oxygen flow? I think I learned that on Quincy, M.E., years ago, when the clue that pointed to murder was the dead woman’s painted fingernails. She had died during surgery, and her nails were still beautifully manicured. Quincy had overlooked that detail at first: Don’t women often have painted nails? Ah ha!, though, not if they’re having surgery; the surgical team needs those nails bare. Quincy removed the polish and found the cause of death: a lethal injection to the nail bed. Not only do my hands tend to unnecessary tasks when nervous, my mind does, too. Yesterday at noon, while I was lying on a gurney in the pre-op room, I thought about how much I didn’t want to go through with the non-invasive, elective-yet-recommended procedure (an endometrial ablation). I’m not sure what I was worried about, or why I felt so fragile; maybe hospitals just put us in that mindset. I had the power to leave, yet I stayed on my gurney, voluntarily. I thought about authority. Is it the authority of the capitalist medical establishment that’s pinning me here? That might be the Marxist argument, the feminist argument. Okay, those are valid. But, maybe authority can also be a benevolent thing. I could have gotten up and walked out and tried some sort of herbal or alternative cure for my heavy periods, for my anemia. You know what though? I’ve already tried a lot of lesser treatments, and they have been only mildly effective. I was ready, after a long time, to put myself in the hands of authority, of someone who would say, “I’ll take care of this.” Authority keeps getting a bad rap, I thought as I lay there. Sometimes we need authority. We need being taken care of, in a kind and right way. There was not much prep for this surgery: take off your clothes — “Everything,” said the nurse. — and put on this johnny. Lie down under the blanket. Wait. I eavesdropped on the other patients and nurses. A woman across from me was in for bilateral breast reduction. I looked sneakily across at her. She sat up in bed, and, under her johnny, I could see the shape of her breasts resting on her lap. Another woman was having eye surgery for polyps and a tubal ligation; a two-for-one, I guess. I heard, but I did not see, a woman near me who had her third baby the day before, and was down from the maternity floor to get her tubes tied. A century ago, I thought, none of this would have been possible or even considered necessary. At least five clinicians interviewed me: the pre-op nurse, the surgical nurse, the surgical gynecologist, and the anesthesia team. The first three were women, and the team, men. The anesthesiologists asked the hardest questions, and I was okay with that, because that was the part of surgery I was really fearful of. I’ve never had general anesthesia, and isn’t that how people die — not so much from your blood dripping out of intentional wounds, but from your decreased heart beat, brain waves, oxygen level, respiration? Dr. Shapiro, who seemed to be the lead anesthesiologist, also undertook the procedure I feared the most: the insertion of the i.v. needle into the back of my hand. No, I’m not afraid of needles! My veins are hard to pin down, as many phlebotomists and nurses have told me, and I told him that too. He insulted my veins: “Well, many diabetics have trouble with their veins.” No, it’s not that, I protested. I’ve always had a problem. I think he looked at me skeptically. And it’s not the needle; it’s all the huffing and puffing and the grimacing that goes on when someone tries to start a line on me. It’s upsetting. He looked at me skeptically again, as though maybe I didn’t know who I was dealing with, the Master of the I.V. I loved that. Cherub veins. I also loved when the surgical nurse said to me, as they were wheeling me down the hall into surgery: “Think of the dream you want to have?” What, really? “Yes.” I thought of the first thing: I’ll dream of the beach. She replied, “Dream of the beach from last summer.” Okay. “Which one?” she asked. The one near my parents, on Cape Cod. Cold Storage Beach. I started my dream. The nurse put a pressurized boot on my right foot. Everyone was in blue and talking, talking, talking. When I woke up, I didn’t want to wake up. I felt filled with cement. Another nurse, in a much nicer room — the Recovery Room — asked me how I felt. Filled with cement. I closed my eyes. She kept coming back, kept pestering me. How do you feel? How do you feel? How do you feel? She got me ginger ale. She pressed a button on the i.v. for pain. Percoset, I think. I closed my eyes. A few times, I forced myself to open them, just to be sure I could. Why get up? Why move? A long time ago, people got to stay overnight in hospitals. That’s what I wanted at 4pm yesterday: to stay overnight in the hospital. To not move. To sleep. To have a nurse like this occasionally hold a straw to my mouth. She tried once to get me to sit up. Oh, no, I muttered. She let me lay down again. She came back, and we tried again. Against my desire, I put my feet on the ground, and I sat in what looked like a reclining chair on wheels. She wheeled me into another room. I had a sense of being not a very important patient anymore, and I wanted to go back. I could tell, although no one told me, that I was on my way; this room with people in reclining chairs was the last stop before up and out. The woman nearest me, I heard, had some tubes surgically installed. When the doctor cheerily said to her, “Good bye, and good luck with your chemo!”, I knew why. I also said to myself, Come on, Jane, open your eyes. This is nothing in comparison. Jimmy sat there, on my right, while I opened and closed my eyes, trying to be awake. A louder nurse, a more business-like one, who probably played field hockey in high school and college, she seemed that vigorous and that insistent on vigor, gave me a five minute warning that she was going to walk me to the bathroom. Let me be, I thought. And yet I got my legs to stand. I walked. Jimmy came along, and I got him to come into the bathroom with me, which is so not like me on a good day. I mostly want to do it myself — that’s another part of my m.o. I shuffled back to the chair. I got dressed, with Jimmy’s help. He went to get the car. The nurse brought me down to the curb in a wheelchair. The woman with the tubes installed, who was about to start chemo, had walked out with her daughter. Home, I reclined in bed and looked out one window, into the street, and the other window, into the branches of the Japanese maple. I took three Advil; that’s 600 mg. Jimmy got me the prescription for Percoset, but I doubted I would take it. I wasn’t in that much pain that I wanted to submit to the mood depression it brings on. The heating pad and the ibuprofen and some of Eli’s peanut butter cups, which he got from campers at camp yesterday because it was C.I.T. Day and he’s one, were treats. Grace sat in bed next to me and watched Hey Arnold! on the laptop as I closed my eyes. Lydia came in. Jimmy came in and out; once he brought me a peanut butter sandwich and I got to eat in bed. I experienced my brief convalescence as a delicious, long moment, which lasted all of last night. I slept; I ate, I felt my bare feet occasionally touch Grace’s. I had no where else I had to go. It was probably delicious because I knew it would be brief, with a happy ending. Today the sun is still here. My neck is inexplicably the only part of me that hurts; it’s stiff, whiplashed. I went outside to check on the sunflowers; there are three that have burst, including a dark red one, and a few more on the way. I stood on the sidewalk and looked, and my attention was drawn first to the eye of a bunny cowering, low on the ground, among all the stalks. His body was absolutely still, and the eye tracked me. I didn’t move, although I looked to the house, caught Jimmy’s eye, and made the signal for “camera.” When he opened the front door to bring it out, the bunny hopped off. As I stood there, waiting for the camera, I felt glad that I had spotted the bunny. It explained why the sunflower stalks are occasionally bent sharply, about 6 inches from where they emerge from the ground. Last week I had seen bunnies nibbling at the stalks of other shrubs; it’s not the flowers they’re after: It’s stem and wood. The neat thing about sunflowers, though, is how adaptable they are to being chewed on. The stalks weaken and bend over, yet still the head of the sunflower, now lying on the ground, still grows and even turns upright to the light. Some of them I have staked back up, just because I cannot leave well enough alone. Some of them I leave be, their flowers getting nourishment from the channels in the stalk that have not been gnawed through and still flow down to the roots underground. I had no idea you were planning this procedure. As you know, I had one several years ago. It sounds as if yours went okay. I am pleased to hear that. And I wish you a good recovery and positive results. Jan, I recall your experience, and, in fact, that helped me articulate some good questions for the doc, and her answers were reassuring. Today I feel good, and I’m keeping my fingers crossed on the long-term. 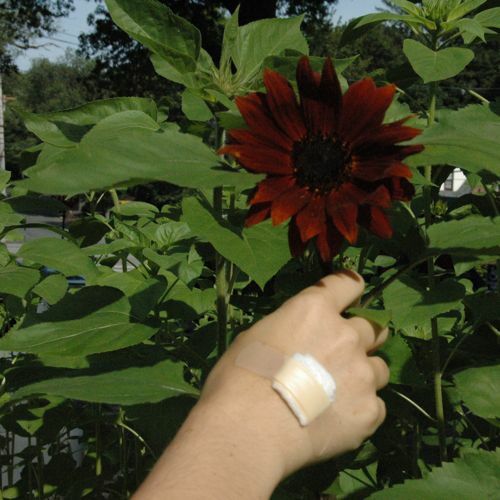 What a beautiful post, Jane; I especially love the ending, about the sunflowers (which, like you, seem to be quite adaptable to being pestered–by bunnies, nurses, anesthesiologists, whatever). And I laughed out loud at the field hockey line–that told me *everything* I needed to know about that woman. Hope you’re feeling 100% soon! When I started reading this beautiful post my heart skipped a beat, because like Jan I had no idea this surgery was in the works for you. Glad you’re on the mend. I loved this post! And, yes, sometimes I find that embracing Western Medicine is okay. Glad to know you’re well and that you got a lovely essay/post from the experience. Like the other posters, I am glad you are well and I wish you more good health. I really enjoyed reading this lovely post as well. It’s important to write about these experiences, and you write about them beautifully. I’m so glad the procedure went well, Jane, and I loved reading your post. Your writing ‘voice’ is so wonderful — it always feels like you are there, telling me everything… in person. I’ll be darned. I feel as though I should have known this happened. But this is what I get for being in P.E.I. on dial-up. Anyway, I’m glad it went well and like others, I enjoyed the writing that came of it.